Darrel Friesen wrote: The "Cherry Challenge"!. But, I have no cherry on hand. How about the "Indigenous Challenge". Here's a couple of defintions from Wiki. Indigenous resources, resources which exist within local geography, that are not imported. Indigenous species are those established in a given region, having originated there, or been long settled without human intervention. I have enough American sycamore and pine harvested from my own back yard to build a few instruments. I kind of like that "indigenous Challenge" idea too. I think this idea has been floated before, and would definitely be described as a "challenge": the Hardware Store Build Challenge. Any stringed instrument, with all parts (bonus points for tuners and strings!) coming from a single hardware store, whether it be a Borg or a mom-and-pop shop. Hi Arnt. I for one hope that this rule is not changed. I'm nearing the end (thank all the gods of the aether!) of processing 16,000 old forum discussions into the new Library. At a guess I have deleted over a thousand discussions only because the off-forum images the person posting had linked to were gone, rendering the discussion useless. The only way to guarantee that the image links won't die is to require that images be posted here so they are part of the permanent forum database. I really have to agree with Deb here. One of the real values to me on the old forum was cruising the "Proud of my work" section of the library for inspiration. No takers on the Hardware Store idea? Most places around here, from Ace to Home Depot, have at least maple, oak, and poplar for hardwoods and pine, doug fir, hemlock, and cedar for softwoods. That would even sort of include the whole "indigenous" idea. Plenty of hardware. Ok, so frets, tuners, and strings would probably be sourced elsewhere, but if you were hard-core you could even build pickups from hardware store parts! My vote is for hardware store. While we might see a lot of PVC walking-stick fiddles and Danelectro-style 'pegboard' guitars as a result, we may also be lucky enough to have a standout "bathtub" solid body guitar, faced with grouted tile and Hot/Cold handles functioning as Volume/Tone knobs. To make everyone happy, I might suggest hybridizing the two concepts - make an instrument out of a mix of both indigenous woods and hardware store materials. The ratio of one to the other is up to each entrant. If we did an "indigenous" challenge, that could very easily include any hardware store parts. Getting your parts cheaply from any source you want is a part of this! I don't want to offend anyone here by what I am going to say....but I wouldn't want to do a hardware store only challenge because I want to end up with a serious instrument, and not one made from PVC and plumbing. And that's possible when using indigenous sources, I still gig regularly with the telecaster that I made in the 100 dollar telecaster challenge. I know there is a "cute" factor in building a guitar made from a a toilet seat, but I don't want to gig with that. I think this is what Mark's getting at, too. I hear ya. Wow, I didn't even think of funky "folk" instruments. There are some folks for whom this would really get the creative juices pumping! Alan Peterson wrote: While we might see a lot of PVC walking-stick fiddles and Danelectro-style 'pegboard' guitars as a result, we may also be lucky enough to have a standout "bathtub" solid body guitar, faced with grouted tile and Hot/Cold handles functioning as Volume/Tone knobs. Really, in terms of hardware store items, I was just thinking poplar + maple + screws and bolts = electric guitar. My daughter really likes that transparent wood stain and has been eyeing the pink! How about we require a certified chain of custody for all wood and hardware used to verify it was sourced locally, say within 50 miles? Seriously, combining the two would be good. Be creative and find as much locally (outside of the local music shop) as you can and only "import" the parts you can't create otherwise. This could all be factored into the judging. I like both the domestic wood, and the reuse/recycle ideas. Also how about scrap box instruments - use wood left over from previous builds. To jump in the picture posting controversy, I don't mind uploading pictures to MIMF (I guess because I'm not one of those who automatcally uploads them to PhotoBucket or the like) and I see real advantages for doing so. It doesn't mean you can't put them elsewhere in "the cloud" but it does mean they'll still be available when a discussion is archived. Also, when checking the discussions from my work computer, I frequenly get blocked by our firewall from accessing those "cloud" picture storage sites - you know, there might be something obscene or indecent posted somewhere in there, so just block the whole site. The only problem I have is the limited file size - I think this needs to keep pace with the times. Using our older 10-megapixel camera, I could go into MS Office Picture Manager, crop a photo, and compress it to "web pages" size, and it would generally be under the old forum size limit. Then we got a 16-megapixel camera last Christmas. Now, the same process yields a jpeg file that is just over the new forum size limit. To me, it would make a lot more sense if I could just upload whatever file size and the MIMF software could resize it automatically before storing it on the server. Thanks for the input Jon. There do seem to be some automatic photo resizers out there for phpBB, but it may take me a while to look and test them (most of them just shrink the pixel dimensions and don't actually affect the file size). In the meantime, would 150k solve most of your problems? 100k should be plenty big enough. This picture (from a previous challenge) is 800 x 685 and is only 50k. Check out a program called Irfanview. I think it was free and it's a great image editor. Gimp 2.6. Free and easy. I liked the acoustic challenge we did a couple years ago. There were still many uses of otherwise unorthodox materials. And the "purists" participated as well. 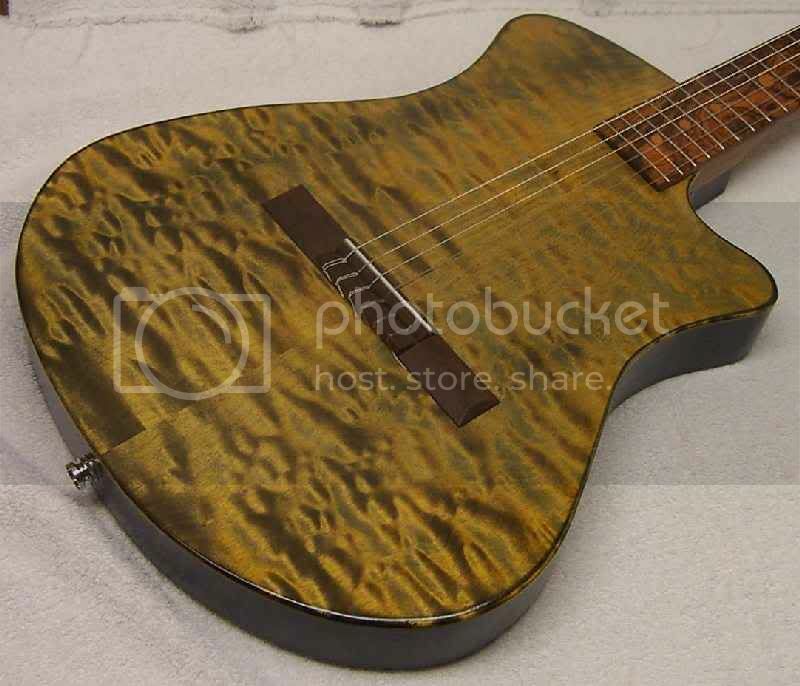 We could have one acoustic challenge, but maybe a few divisions, like the "Traditional" build, the "Unorthodox Materials" build, and the "World Instrument" build, or whatever. Then we could do a best of for each division and an overall winner. It was fun watching Peter Wilcox, with his imaginative use of household items and humor, as well as the craftsmanship of Alan Carruth and that amazing harp guitar, and everything in between. And all of this under one challenge. One thing that might be fun is a hand tool only challenge. It would be a good excuse to develop/refine our hand skills, allow some to show off and inspire lurkers who are intimidated by the initial investment in all the tools they think they have to buy. We could run this one with an extended deadline. I was also thinking it might be cool to do a u-bass/ashbory challenge. Everyone could buy a set of those new polyurethane bass-Uke strings (or other materials) and go from there. I bet there would be several really interesting takes on the project, and who doesn't secretly want one of these? One idea would be an instrument appropriate for a child less than 10 years of age (or some other selected age). Another idea would be to require a keyboard as part of the instrument. This could be a traditional instrument, or a newly invented hybrid. I like Bryan's idea. I would be ready for the Ashbory type of challenge!! !